It’s a scandalous reality that millions of farmers and workers are still being ripped off despite working hard to provide the products we all love. Inequality in global trade is rooted in exploitation dating back centuries. Across the globe, hard-working producers are unravelling this legacy. They’re standing up and fighting for a fair deal, a deal which Fairtrade can provide. A deal which empowers them to work their way out of poverty and degradation and to build their own successful businesses delivering goods that are demanded across the world. A fair deal. It’s a well-known fact that together we’re stronger whether that’s in local communities, national politics or just in our day to day lives. The decisions we take can have far reaching consequences right across the globe. Buying Fairtrade here in the UK is no different and by doing so you are delivering change. Not based on handouts or charity but through the simple idea that we pay a reasonable price that allows the suppliers of our; chocolate, tea, coffee, fruit, gold, cotton, flowers and sugar to build their own communities and livelihoods by selling products we could not imagine today living without. Fairtrade has made great progress and there are now over 4500 Fairtrade products available in the UK, however now is no time to rest on the achievements made. With the changes we see taking place across the world from Trump to Brexit the strength Fairtrade gives local communities is more important than ever. 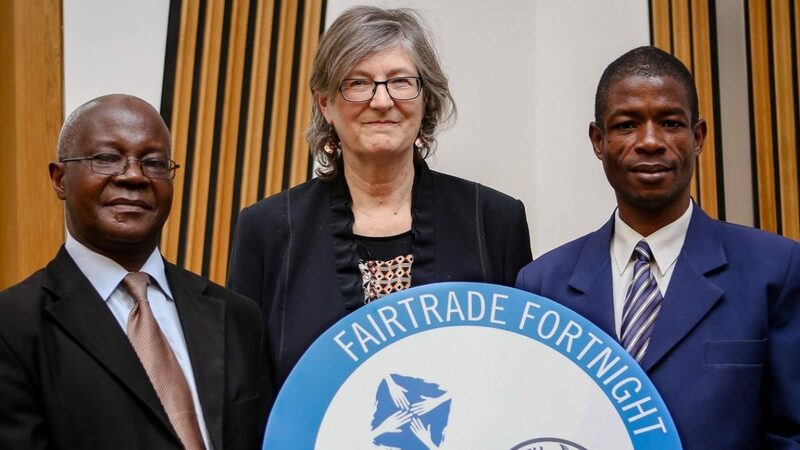 As a Scottish Co-operative Party MSP I was delighted during Fairtrade Fortnight to meet my fellow co-operators from Mzuzu Coffee Planters Co-operative Union. Bernard Kaunda and Christopher Gondwe attended a very interesting meeting in the Scottish Parliament and told us about their co-operative. Mzuzu is a coffee planters co-operative established in 2007 which champions the economic empowerment of their small coffee growers. Mzuzu is made up of 6 differenet co-operatives as business centres and business zones. Their mission is to be world class producers, processors and marketers of speciality and certified coffee through sustainable coffee co-operatives and sustainable coffee based farming systems. Mzuzu has been Fairtrade certified since 2009. Mzuzu has been selling up to 70% of its coffee as Fairtrade on the market. Mzuzu currently sell their coffee around the world and more locally to Matthew Algie and to Finlay’s via Twin Trading. Traidcraft also sell Mzuzu ground coffee as part of their speciality Fair Trade range. It was excellent to see so many fellow co-operators and Scottish Labour members sign our petition to protect the world’s poor from Brexit at our stall at the Scottish Labour Conference.